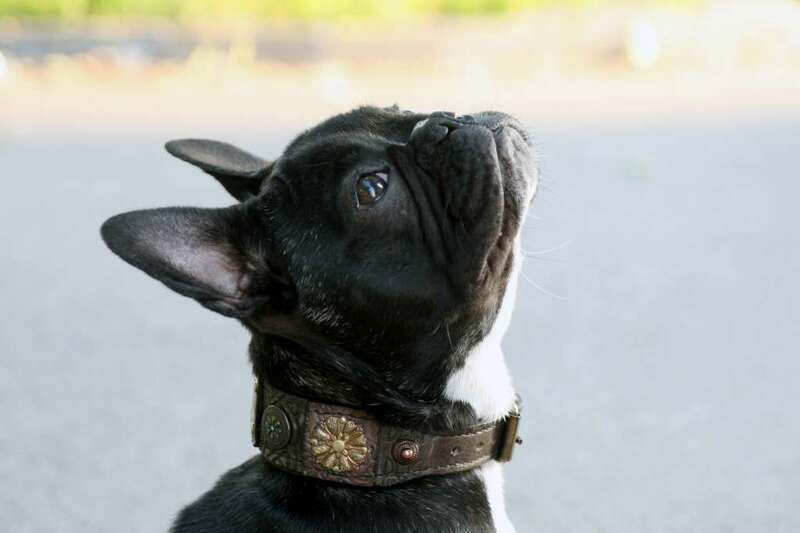 Walk your tiny furry friend in a big style with Sauri’s designer small and extra small leather dog collars! 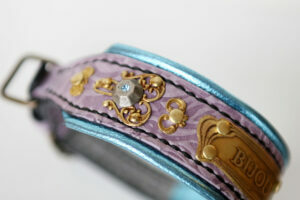 Cuteness and beauty intertwined with a high quality of craftsmanship. When we design for small breed dogs we keep in mind that they often have extra sensitive skin and pay much attention in choosing the right leather for lining. 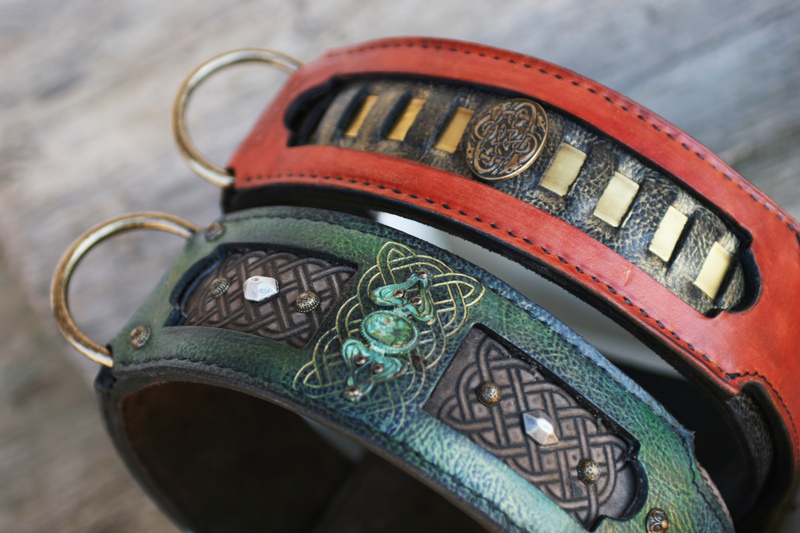 Sauri’s handmade small and extra small leather dog collars comprises 2 or 3 leather layers, depending on the design, breed and leather characteristics. Inner leather layer is either nubuck or soft leather padding. 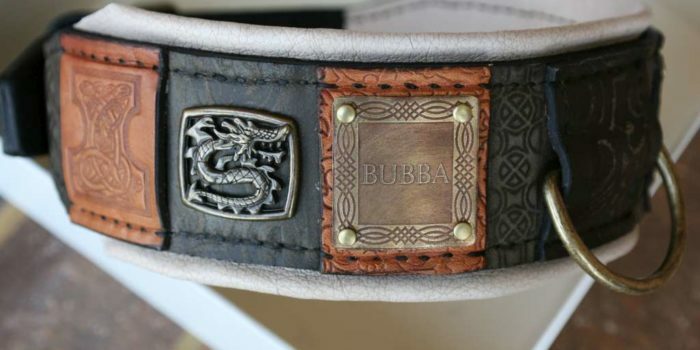 We are among few who hand stitch the buckle part and we do so because hand stitched buckles are hundred times more durable. Besides this very obvious advantage, avoiding rivetting on the collar’s inner side shows its benefits for dogs with sensitive skin. So if we follow this guideline with the largest of breeds, you can be sure that the same rule shall be applied for your tiny dog friends. 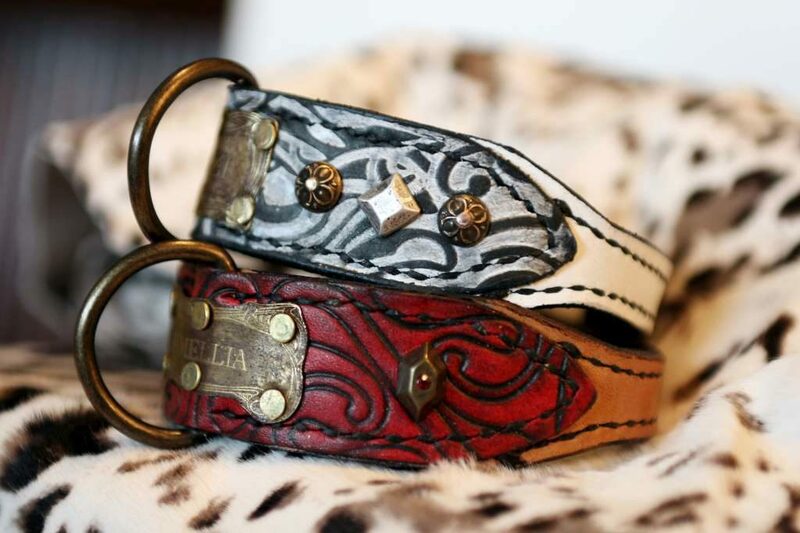 When it comes to the design, we strive to grasp a whole lot of beauty and transform it with our crafting knowledge into a practical and durable small and extra small leather dog collars. Our smaller sized furry friends give an impression of great perseverance and miniature unobtrusive dignity and it is our opinion that unique collar designs should match their interesting special characters. 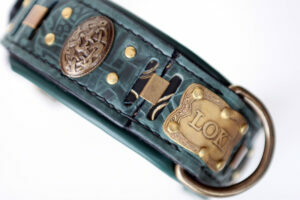 If there is a special symbolic related to your dog’s name we can incorporate it in a collar design. We also design and hand craft unique vintage looking brass name plates. It is possible to engrave your telephone number too. 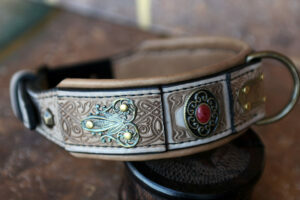 For some small breeds we are even able to make replicas of the rustic molosser collars from our shop. Minimum collar thickness required for decorations on all Sauri designs is 1 ½“. 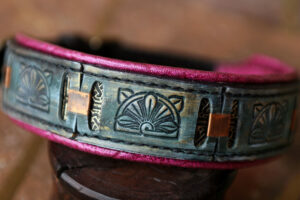 All Sauri leather collars are widest at the back of dog’s neck with ends tapering under the chin for greater comfort. Give it a try and contact us today. Designing is our pleasure! Previous article	Japanese Tosa and other dogs – yes or no?